Holiday Inn guests near Atlanta may soon find themselves lingering in the lobby, except it won't really be a lobby but a "social hub," complete with food and booze. 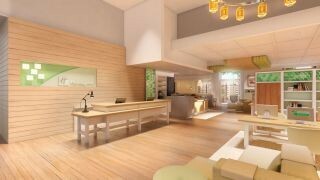 The Holiday Inn Atlanta-Gwinnett Place in Duluth, Georgia, in June, will become the first in the 3,400-hotel Holiday Inn chain to test the new concept that combines the front desk, restaurant, bar and business center into a 5,000-square-foot eat, play, work area. The result: This won't be your grandparents' Holiday Inn any more. Holiday Inn just finished a $1 billion relaunch and rebranding last year, the largest such effort in the hospitality industry -- including everything from new signage to replacing old paisley bedspreads with white bedding. But Eric Nicolas, director of global brand management for the Holiday Inn, tells AOL Travel News the creation of the 24/7 social hub is even more radical. "Franchisees who saw this said this is the next thing for the brand, bigger than the relaunch. We think the impact is going to be tremendous, on the range of big to huge," Nicolas says. In researching the new social hub concept, Nicolas says Holiday Inn found its customers want "value, consistency and something that is not going to spook them." So, he says, "You won't see them going into a boutique hotel and saying 'Ooh, ah, I love this three-legged chair." But that doesn't mean the new concept doesn't borrow from hip social spaces of, say, a W Hotel. "We are meshing spaces, really messing up the hotel environment," Nicolas says. "This is not high design, but a more holistic experience. Don't think that Holiday Inn is going trendy." In the Holiday Inn social hub, guests will be able to drink a cappuccino in front of a computer; eat at the bar, at a table or booth or on a comfy couch or lounge chair; sit and watch sports on screens; play Nintendo; or just hang out. There are even plans to incorporate outdoor spaces –adding a fire pit outdoors so people can socialize over s'mores. They may even add open-air cabanas. "People no longer want to seclude themselves in their rooms," he says. "But women and also a surprising number of men have told us too, 'I don't feel good going into a bar. It seems like I am looking for something.'" With the new approach, "We mesh everything together, and guests can do anything anywhere – have a cocktail or even dine on a couch. We are really making the space flexible," Nicolas says. In the morning, there will be a traditional breakfast buffet as well as "grab and go" stations for those on the run. For dinner, "There will be no Duck a l'Orange. No snails. But fresh food at competitive prices," Nicolas says. Currently being tested is an ice cream waffle sandwich and a USDA beef hamburger with a fried pickle. The menu will also include food to share like sliders and chicken fingers. The social hub will likely have a branded name, still to be determined, and staff will have new uniforms. The chain plans to use the test at the Atlanta-area property as a Petri dish to gauge reaction, and then expand the concept to a few other properties this year and next. Because big construction is involved in creating the new space, the social hub will first launch in new-build properties and hotels that are up for renovation. "It will be 5 or 6 years before we start to have some distribution," Nicolas says. Right now, he adds, "We can't wait to get this thing started to see how consumers react."